At first approximation, there are two motivations for donating money – egoistic & altruistic. The egoistic motivation for donating is highly scope insensitive – giving away $500 feels roughly as good as giving away $50,000. I haven’t found any academic evidence on this, but it’s been robustly true in my experience. This scope insensitivity seems pretty baked in – knowing about it doesn’t make it go away. I can remind myself that I’m having 100x the impact when I donate $50,000 than when I donate $500, but I find that when I reflect casually about my donations, I feel about as satisfied at my small donations as I do about my large ones, even after repeatedly reminding myself about the 100x differential. We’re probably also scope insensitive qualitatively – giving $5,000 to a low-impact charity feels about as good as giving $5,000 to an effective charity (especially if you don’t reflect very much about the impact of the donation, and especially especially if the low-impact charity tells you a compelling story about the particular people your donation is helping). EA sometimes advocates that giving will increase your happiness. Here’s an 80,000 Hours article (a) to that effect. Here’s a piece by Giving What We Can (a). I think sometimes implicit here is the claim that giving effectively will increase your happiness (I think this because almost all other discussion of giving in EA spaces is about effective giving, and why effective giving is something to get excited about). It seems pretty clear that donating some money to charity will increase your happiness. It’s less clear that donating to an effective charity will make you happier than donating to a low-impact charity. Given the scope insensitivity of the egoistic motivation, it’s also unclear that giving away a lot of money will make you happier than giving away a small amount of money. It seems especially unclear that the donation-to-happiness link scales anywhere linearly. Perhaps donating $1,000 makes you happier than donating $100, but does it make you 10x as happy? Does donating $2,000 make you 2x as donating $1,000? My intuition is that it doesn’t. Okay, so that’s a bunch of discussion from intuition & lived experience. Now let’s look at paper. Jebb et al. 2018 analyzed Gallup Worldwide Poll survey data on income & happiness. This dataset had responses from about 1.7 million people in 164 countries, so we don’t have to worry about small sample size. Jebb et al. were curious about the income satiation effect – is there a point at which additional income no longer contributes to subjective well-being? And if there is, where is it? 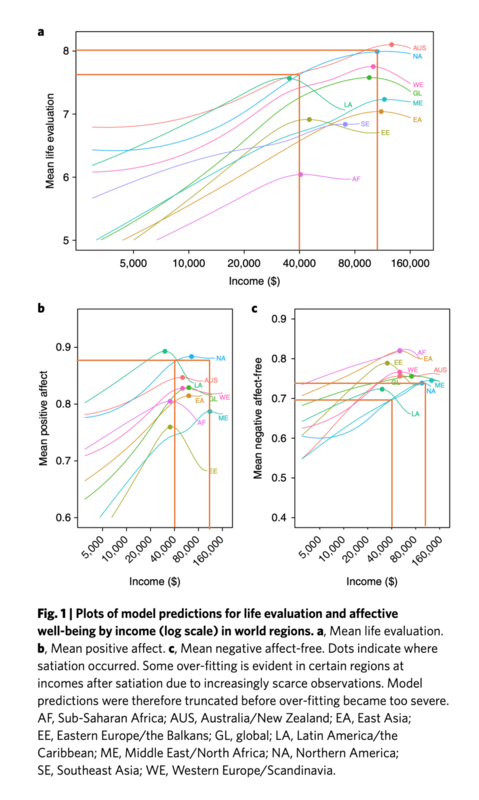 Globally, happiness stopped increasing alongside income after $95,000 USD / year. For Western European respondents, happiness stopped increasing alongside income after $100,000 USD / year. For North American respondents, the satiation point was $105,000 USD / year. Emotional well-being (sometimes called hedonic well-being or experienced happiness) refers to the emotional quality of an individual&apos;s everyday experience – the frequency and intensity of experiences of joy, fascination, anxiety, sadness, anger, and affection that make one&apos;s life pleasant or unpleasant. Life evaluation refers to a person&apos;s thoughts about his or her life. Surveys of subjective well-being have traditionally emphasized life evaluation. The most commonly asked question in these surveys is the life satisfaction question: “How satisfied are you with your life as a whole these days?” ... Emotional well-being is assessed by questions about the presence of various emotions in the experience of yesterday (e.g., enjoyment, happiness, anger, sadness, stress, worry). Jebb et al. break down emotional well-being further into positive affect & negative affect, which roughly correspond to experiencing positive & negative emotive states. Life evaluation seems like the more intuitive metric for our purposes here. (It’s also the more conservative choice due to its higher satiation points.) So when I talk about "happiness," I&apos;m actually talking about "subjective well-being as assessed by life evaluation scores." My main points would still hold if we focused on emotional well-being instead. The income satiation point for most EAs is at least $100,000 USD / year. Most EAs are in North America and Western Europe. The satiation point for life evaluation in Western Europe is about $100,000 USD / year. The life evaluation satiation point in North America is about $105,000 USD / year. Almost all EAs fall into Jebb et al.’s "high education" bracket: 16+ years of education, i.e. on track to complete a Bachelor’s. High-education populations have higher satiation points than low-education populations, an effect that the authors attribute to "income aspirations or social comparisons with different groups." The "high education" satiation point is $115,000 USD / year. That’s a global figure. The paper doesn’t give a region-by-region breakout of the "high education" cohort; it’s likely that the figure is even higher in the Western Europe & North American regions, which have higher satiation points than the global average. Essentially, all income earned up to $115,000 USD / year (for college-educated folks living in North America & Western Europe) contributes to one’s happiness. Correspondingly, donating amounts such that your annual income remains above $115k probably won’t affect your happiness. There’s a wrinkle here: it’s possible that much of the happiness benefit of earning a high income comes from the knowledge that you earn a high income, not what you use the money for materially. If this is the case, donating large amounts out of an income above $115k shouldn’t ding your happiness. So perhaps only a weaker version of the claim holds: once you achieve an annual income above $115,000, you can give away large portions of it without incurring a happiness penalty (having already realized the happy-making benefit of your earnings). But even in this case, donating large amounts out of an income less than $115k still lowers your happiness (because you never benefit from the knowledge that you earn at least $115k). It’s true that the act of donating will generate some personal happiness. But given the scope insensitivity at play here, you can realize a lot of this benefit by donating small amounts (and thus keeping a lot more of your money, which can then be deployed in other happy-making ways). From a purely egoistic viewpoint, scope insensitivity lets us have our cake & eat it too – we can feel good about our donating behavior while keeping most of our money. My provisional conclusion here is that EA shouldn&apos;t recommend effective giving on egoistic grounds. There remains a strong altruistic case to be made for effective giving, but I think it’s worth acknowledging the real tradeoff between giving away large amounts of money and one’s personal happiness, at least for people earning less than $115,000 USD / year (on average, for college-educated people in Western Europe & North America). If you want to give large amounts while avoiding this tradeoff, you should achieve a stable annual income of at least $115k before making substantial donations. Further, EA should actively discourage people from effective giving if they&apos;re mainly considering it as a way to become happier. Effective giving probably won&apos;t make you happier than low-impact giving, and donating large amounts won&apos;t make you happier than donating small amounts. Saying otherwise would be a false promise. Thanks to Gregory Lewis, Howie Lempel, Helen Toner, Benjamin Pence, and an anonymous collaborator for feedback on drafts of this essay. Cross-posted to my blog. i) Like Greg [EA · GW] I've only ever seen the claim that donating some can be better for one's own welfare, compared to a baseline of not giving at all - not that the EA approach to giving is actually the optimal for happiness (!). I've only ever seen the claim that donating some can be better for one's own welfare, compared to a baseline of not giving at all - not that the EA approach to giving is actually the optimal for happiness (!). Clarified my view somewhat in this comment [EA · GW]. See also this comment [EA · GW]. Thanks for this; I accord with almost all of what you're saying. Re: the community benefits of EA, these mostly seem to accrue via active participation in EA spaces (the Forum, facebook groups, working with EA orgs, attending meetups & conferences), rather than by making large donations. Thanks, I edited that part of the piece to get more accurate about 80k's view & the thing I'm pointing to. More on what I'm pointing to in this comment [EA · GW]. Upvoted for bringing in a lot of cool research! Didn't strong-upvote because I felt the conclusion was a little too strong ("actively discourage", especially), and I wish you'd linked to some examples of EA promoting egoistic giving. 1. I sense a really fantastic opportunity here to trick Buzzfeed into donating a lot of money: "$10 charitable donation vs. $1000 charitable donation". 2. Is there a particular case of EA communication that you think actively goes against the science you cite? I vaguely remember seeing writing in a few places along the lines of "giving can make you happier" or "giving effectively can make you more confident" (and by implication, happier), but not "giving more can make you happier". 3. It would be good to see one of these studies specifically take on EA-style giving, where people often have an unusually strong sense of what their money is buying and can feel unusually confident that it will actually help. Most charities don't have anything nearly as immersive as GiveDirectly Live, a website which (to me) makes every additional dollar I give pretty darn salient. 4. "Actively discouraging" people who want to use effective giving to become happier seems far too strong. For one, the studies you cite generally look at large numbers of people; even if giving doesn't make the average person happier, it still seems like it could make any given individual happier. If we want to give maximally accurate information, we could say "there are a lot of different things that might work, giving is one, saving your money might be better", but our ability to advise individuals seems really context-dependent. I've known people who I thought would actually be a lot happier upon donating more; I've known other people for whom "get financially secure so you can have FYM ASAP" was better egocentric advice. ...maybe we should, instead of saying "no", say "why not consider trying to want other people to be happy, too?" Becoming more altruistic in spirit/personality seems to be pretty helpful for a lot of people. I don't know how much the science backs that up, so I wouldn't recommend it as an official response, but "caring about other people makes you happy" does seem like one of the strongest cross-cultural "common sense" lessons in all of human experience. Re: this part of 4 in particular – "there are a lot of different things that might work, giving is one, saving your money might be better"
I think Jebb et al. 2018 gives evidence that saving your money would be better than making greater-than-nominal donations, at least until you achieve financial independence. Re: 4 & 5 – it's kind of an edge case, because I think everyone is motivated by both egoistic & altruistic drives to some degree. I don't know of any evidence that donating effectively makes someone happier than just donating. I agree that the link is probably heavily sublinear. But I wonder if it becomes less sublinear if one is more conscious of impact-per-dollar. I've had this experience myself, sort of, in that I began to enjoy giving more after I found EA and my previous "well, I hope this works" feeling resolved into "yes, I found the best deal on helping!". And since I know that I've found a good deal with high-EV returns, giving more does feel better, just as it would if I were depositing more money into a high-yield investment. Meanwhile, because I have enough money to be materially comfortable, the idea of "$1000 in savings lets me skip working for another two weeks in 40 years, assuming I even want to stop working" doesn't hold much appeal, compared to "spending $1000 on one of the world's best products". I think there are many other use-cases for savings than just retiring earlier (e.g. Jeff & Julia's mercury catastrophe, which cost $50,000 to clean up). This is certainly true! Money can buy almost anything, including security against future disasters. I'm only making a personal claim about myself and my own use of money. I personally often feel like giving is the form of spending that will make me "happiest", because it feels like a direct path to me getting a sense of personal satisfaction in a way that saving often doesn't. People are more likely to give when certain markers of "effectiveness" are satisfied (e.g. you tell them exactly how the money will be spent, you tell them the charity is relatively low-overhead, you tell them how much progress you've made toward solving a problem). "More likely to give" =/= "more happy after giving", but it does seem to represent something like "anticipates being happier after giving" (that's a reasonable interpretation for why people do almost anything with money). These claims come from what I remember about writing a thesis on giving behavior. The relevant material starts on p. 59, items (1), (4), and (6), though I'm synthesizing a broader base of evidence here (plus a bit of intuition from my experiences talking about EA with people outside the community). EA sometimes advocates that giving effectively will increase your happiness. Here’s an 80,000 Hours article (a) to that effect. Here’s a piece by Giving What We Can (a). Neither of your examples backs up your point. As I noted in prior discussion, not only do these sources not claim 'giving effectively will increase your happiness', I'm not aware of this being claimed by any major EA source. Thus the objection "This line of argument confuses the effect of donating at all with the effect of donating effectively" targets a straw man. Right, the only disagreement I have with that piece is this part: "... once you start earning more than about $40,000 a year as an individual, any extra income won’t affect your happiness that much"
From my current understanding, extra income will continue to affect happiness quite a bit up to at least $115,000 / year (on average for college-educated people in Western Europe and North America, in terms of subjective evaluation of one's life quality). And achieving an income of $115,000 / year is much harder than achieving one of $40,000 / year. I notice I have some difficulty thinking through the implications of a 0.5 bump in life satisfaction on a 0.0 to 10.0 scale, especially when the 0.5 increase is in aggregate across an entire lifetime. On one view, 0.5 doesn't seem like that much. "7.5 instead of 8.0? That's a negligible effect. Once you're at 7.5 life-satisfaction-wise, time to focus on other things." On another view, the 0.5 bump is quite a lot. If 10.0 on the scale is "most satisfying life possible", going from 7.5 to 8.0 could be a big frickin' deal. Also could be a big deal if the 0.5 bump cashes out to something like "one less terrible day per month, for the rest of your life". This consideration is probably dominated by measurement problems though. When I subjectively assess my life satisfaction, I have trouble discerning the difference between a 7 and an 8 on a 0-10 scale (though I'm benchmarking on 10 being "best out of the ways my life has tended to go", not "most satisfying life possible"). I've started using a 0-5 scale because of this granularity consideration. It's much easier for me to tell apart the difference between 3 and 4 on a 0-5 scale than it is to tell apart 7 and 8 on a 0-10 scale. "After a certain point, making more money has severe diminishing returns re: your happiness, as does donating lots of money. So don't lean on making lots of money to make you happy, and don't lean on giving away lots of money to make you happy." There's a temptation to use "donate a lot of money to effective causes" to scratch the "sense of purpose" itch, which I don't think works very well (due to the diminishing returns). I'm not trying to target a straw man. I'm trying to speak to a line of thought that feels alive in the EA community – something along the lines of "giving effectively is a project worth expending substantial effort & resource on." Giving effectively will be good, both for you and the people you're helping. I think this corollary is often conveyed implicitly, but feels real regardless. Giving effectively will be about as good for you as other types of giving, but giving effectively can be more demanding than other types of giving. So there's often a tradeoff between your personal happiness & effective giving, especially if you're giving large amounts out of an income less than $115,000. It's quite possible that EA leaders already agree with this amended corollary, in which case all I'm advocating for is being clear about the happiness<>giving tradeoff. I don't think life evaluation is the right measurement of happiness for this though. I'm pretty egotistical and more income would definitely make me happier, well beyond the threshold here. I make about 100k/year and would definitely be more satisfied with my life if I made 200k. But, that's purely from a "feeling like a success"/social status standpoint. I have no realistic lifestyle use for 200k. I can't even figure out how to use 100k on lifestyle because the things people typically buy are really boring. So even though making more money would make me happier, spending more of it on myself wouldn't. Positive affect is better but may still be affected too much by life evaluation. So negative affect is probably the best measure, since it's more related to the possibility of suffering due to insufficient money. I think you're approaching an interesting point on the earnings curve. Probably making $200k and giving away $100k would be more satisfying than earning $100k and giving away $1,000 (wildly speculating here). I'm not sure that making $100k and giving away $50k of it would be more satisfying than earning $50k and giving away $1,000 though. After reflecting on it for a minute, I think it probably would be, but nowhere near 50x. And you'd be leaving a lot of other happy-making possibilities on the table if you gave away $50k out of $100k (which seems less true for giving away $100k out of $200k).